Knowing your normal glucose levels is the first step in managing diabetes symptoms. Many things influence your blood glucose level, including the food you eat. Medications are a must for some people with diabetes, but there are other measures you can take to manage your condition. One of the key parts of managing all types of diabetes and ensuring that treatments are effective is monitoring your blood glucose level. Many things influence your blood glucose level, including the food you eat, exercise, medications, illnesses, alcohol, and hormones. The only way to learn how your body responds to these different factors is to check your blood glucose levels frequently, with the goal of maintaining normal glucose levels. You and your healthcare provider will discuss the number of times a day you’ll need to check your blood glucose levels, but it usually depends on the aforementioned factors. Blood glucose monitors involve testing a small drop of blood, usually obtained from a finger-prick. Continuous glucose monitors (CGMs) are a more recent development in which a small sensor that measures tissue glucose levels is inserted under the skin. The sensor is connected to a transmitter that wirelessly communicates with a display device. These CGMs, however, are not a replacement for blood glucose monitors, as they require regular calibration with finger-prick blood glucose readings. Additionally, your healthcare provider will want to monitor your A1C on a regular basis. Since A1C testing reflects what your average blood glucose levels over the past two to three months have been, they’re a better assessment of your overall blood glucose management. Most recommendations are to aim for an A1C below 7 percent—meaning that over the past two to three months, less than 7 percent of the hemoglobin in your blood has been attached to glucose. Your healthcare provider will help you determine the target A1C that is ideal for you. 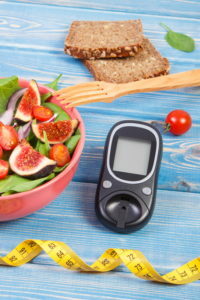 In addition to monitoring your blood glucose levels, you can make lifestyle modifications involving your diet and exercise habits that can help you manage your diabetes. The benefits of a healthy diet are many-fold. Most experts agree that a diet rich in fruits, vegetables, lean proteins, and whole grains (and therefore fiber, minerals, and vitamins) is better than one high in fat and sugars. A healthy diet can help with weight loss, improved glucose levels, improved cholesterol levels, and reduced stroke and cardiac disease risk. 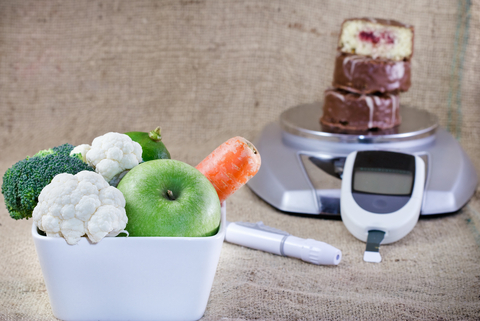 There is no one perfect diet for everyone with diabetes. Often your healthcare provider will refer you to a registered dietician who can help determine the best eating plan for you. Certain foods, particularly carbohydrates, can raise your blood glucose levels more than others, so dietitians may have you employ a plan that allows you to keep track of how many of those foods you consume. Carbohydrate counting: Carbohydrates, particularly simple carbohydrates like sugar or syrup, are foods that strongly influence your blood glucose levels. The amount of carbohydrate a person with diabetes should eat varies by individual. It depends on how severe his diabetes may be, what types of diabetes medications he’s taking, and how active or inactive he is. With carbohydrate counting, a dietitian will help you determine how many grams of carbs you should have with each meal (an example, for some diabetics, 45 to 60 grams per meal is optimal). Packaged foods have labels indicating the amount of carbohydrates in each serving. The amount of carbohydrates in unpackaged foods can be determined with your dietitian or estimated, based on serving size, using nutrition guides. Glycemic index (GI): Some carbohydrates raise blood glucose levels more than others. The glycemic index is a way to compare how much a food will raise your normal glucose levels compared with the standard of how pure glucose or white bread raises your blood glucose. The higher the glycemic index of a food, the more likely it is to raise your blood glucose level. A high-GI food is considered to be 70 or above (examples are pasta and crackers); a medium GI food is 56 to 69 (examples: brown rice and quick oats), and a low-GI food is 55 or less (examples: non-starchy vegetables and legumes). Exercise has several beneficial effects in diabetes management. It can both increase your body’s sensitivity to insulin and increase your cells’ ability to allow glucose in and to use it for energy whether insulin is present or not. You should, however, consult your doctor before beginning a new exercise regimen to determine what is safe for you. Additionally, frequent glucose monitoring may be necessary to determine how different forms of exercise affect your blood glucose levels so that you can maintain safe blood glucose levels. alcohol, blood glucose level, blood glucose levels, blood sugar, blood sugar diabetes, breakfast, cholesterol, cholesterol levels, diabetes, diabetes management, diabetes medications, diabetic, diabetic breakfast, diabetics, diet, exercise, fiber, food, glucose, glucose levels, Glycemic index, glycemic index gi, healthy diet, how to lower your blood sugar, insulin, low gi, lower your blood sugar, normal glucose levels, nutrition, people with diabetes, serving size, simple carbohydrates, skin, stroke, sugar, sugar diabetes, sugar diabetes diet, the glycemic index, types of diabetes, vegetables, vitamins, whole grains. Very informative – Question though. why would my doctor put me on Metformin if I have never come close to the limit of 7 on the chart for diabetis. It’s been between 5.1 and 6.1. It is now 5.1. The high dose I was on made me sick and told my doctor I wanted it cut in half which she did but refuses to totally take me off of it. Thyroid is good, Cholesterol normal ranges, blood pressure controlled (all with very small doses of meds.) I want off the Metformin because I am eating better and have lost 19 lbs. I was about 40 lbs. overweight. I feel better but have times where I feel ill for a few seconds and have noticed my hair is coming out (this is unacceptale, have always had long, very nice hair, many people have told me how pretty it is. I have lost almost half of it and I can’t deal with this, it has to be from medications)!